Indian Prime Minister Narendra Modi is in Switzerland to discuss science, business and the moot question of funds alleged to be hidden in Swiss banks, away from Indian tax authorities. The Swiss deny the claim. Indian Prime Minister Narendra Modi began his whirlwind trip to Switzerland early on Monday by declaring his intentions to meet with prominent business leaders, and scientists at the CERN European research organization, which operates the largest particle physics laboratory in the world. 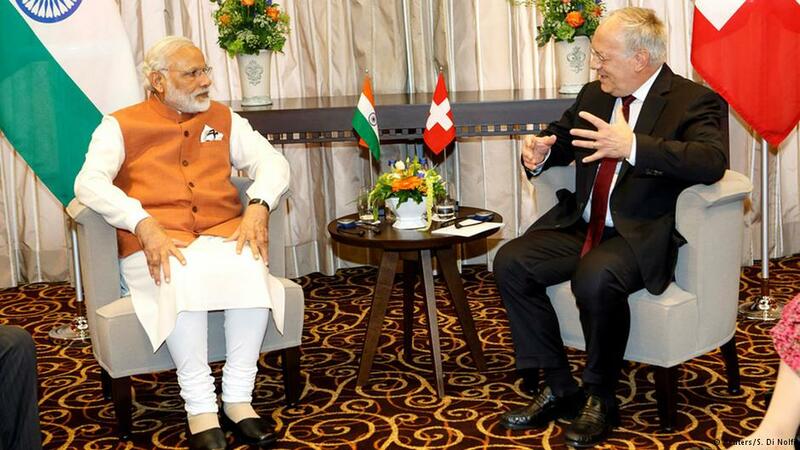 Modi also met Swiss President Johann Schneider-Ammann in Geneva (photo). "In Geneva, I will meet prominent businesspersons. Our agenda will be to expand economic and investment ties. I will meet Indian scientists working at CERN. India takes pride in their contribution to exploring new frontiers of science in the service of humanity," he said. According to Indian news agency PTI, Modi was to press the issue of so-called "black money," or funds stashed by Indian nationals in Switzerland - either because the funds came from illicit profits or were being hidden from tax authorities. Although some reports, including one from India's Central Bureau of Investigation, indicated $500 billion (440 million euros) was hidden in Swiss banks, authorities in the Alpine confederation have consistently denied this. Modi was also expected to ask for Switzerland's support for India's bid to join Nuclear Suppliers Group, a 48-member organization aimed at reducing the threat of nuclear war. Indian membership has been backed the UK, the US and former French President Nicolas Sarkozy. However, some countries have voiced opposition to non-signatories of the Non-Proliferation Treaty (NPT) joining the group. Modi has stopped in Switzerland as part of a five-nation tour which has included Afghanistan and Qatar so far. He is set to leave Geneva for Washington later on Monday.